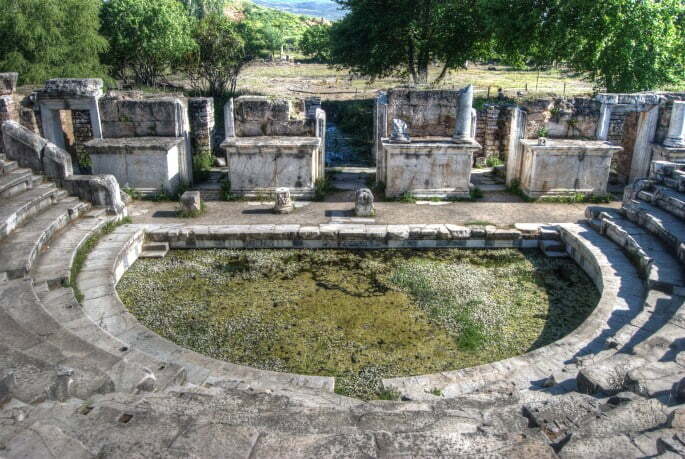 Along with my personal guide, I had arrived in Aphrodisias, the city of sculptures, creativity, ancient ruins and a story of how it dominated one man’s life nearly 500 years after it fell into oblivion. Standing in the long hall of the museum, what I saw left me speechless. The hall had no windows, just four white walls, a door and a shiny tiled floor that reflected everything because of bright lights shining down from the ceiling. Called the Sebasteion Hall, in front of all four walls, was the most impressive collection of life-like sculptures I have ever seen. 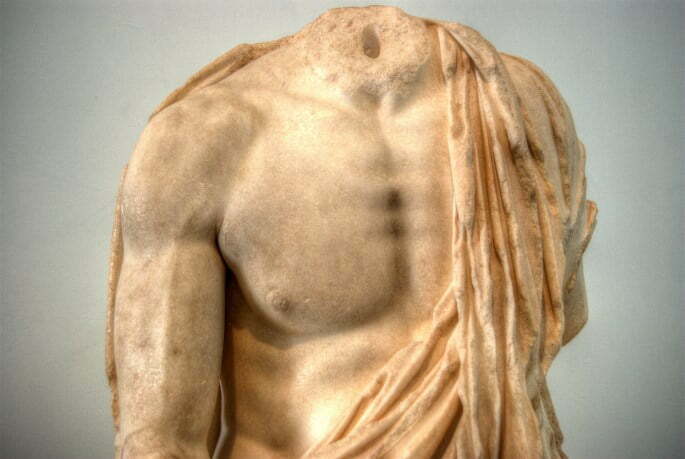 For roughly 5 centuries, the school of sculpture at Aphrodisias was renowned throughout the Roman Empire. People with a need to express creativity would travel from far away to learn the trade from the best. 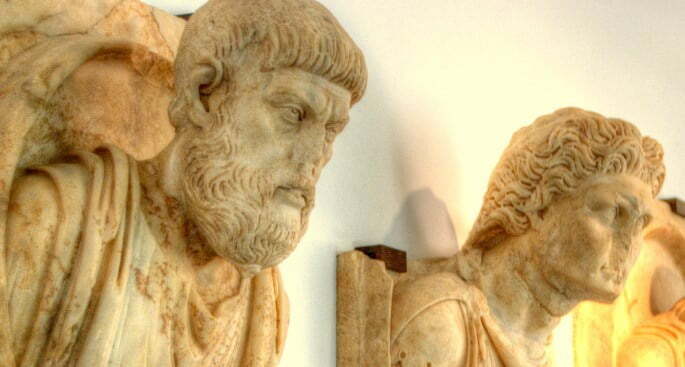 The school of sculptures ran from the 1st century BC to the 6th century and eventually dwindled when the city embraced Christianity. Famous artists from that period also worked in the imperial capital of Rome and masters such as Kobonos and Zenan, were known for their trademark signature work. As I walked through the museum holding all statues uncovered during Aphrodisias’s excavation, it was obvious the extraordinary talent of the artists was not exaggerated. Despite having toured many historical sites in Turkey, I have never seen statues with such intricate details as these. Featuring men, women, children, animals and gods, the remarkable carving of eyes, face expressions and even body muscle stood out instantly. On the statues of prominent citizens like Roman statesmen and high-society women, even the flow of the cloth from their clocks draped around them was replicated with exact precision. The work was the best of that time. Sitting near Aydin city, in the Aegean region of Turkey, Aphrodisias centred itself around the goddess Aphrodite, who represented love. However because of small statues found during excavations, historians determined that the original Aphrodite of the city was in fact the Mother goddess of fertility called Cybele that originated in the Neolithic period. Much like other ancient cities in Turkey, it went through many stages of rule by various empires but over hundreds of years, earthquakes, invasions and wars, left it in ruins. 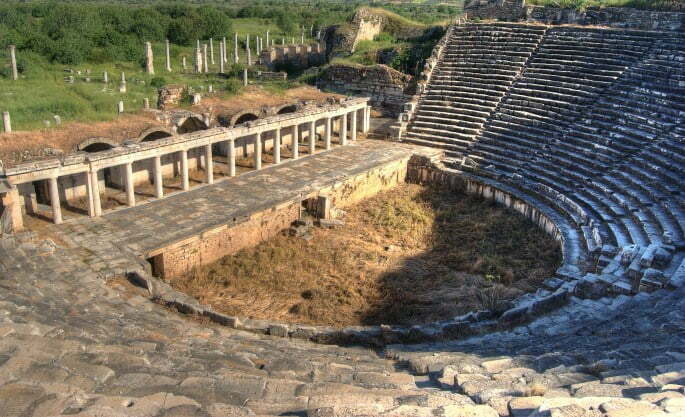 Eventually, the city of Aphrodisias was lost. It sounds absurd to lose a city but after desertion by the citizens, the forces of Mother Nature started work. Buildings, temples, houses and public spaces were eventually engulfed by the natural movement of land, and the soil of the earth swallowed them whole. Then one day, in the 1950’s a young photographer driving to Aydin to photograph a new dam lost his way, and arrived in the small village of Geyre. As he sat there, drinking tea with the locals, he noticed houses built with odd-looking stones. Even on the dusty road tracks, old ancient stones sat there in abundance. Locals shrugged their shoulders, said the stones had always been there and were amused at his excitement but he immediately took photographs and sent them to all major travel publications of that time. Nobody responded so he contacted the famous Turkish photographer Ara Guler, who sent them to a Turkish archaeologist called Professor Kenan T.Erim who worked at New York University. 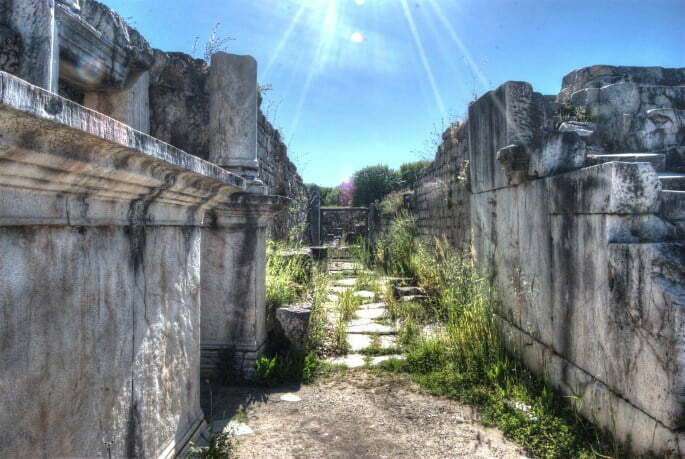 The professor came to Turkey and upon recognizing they had discovered the lost city of Aphrodisias, dedicated the rest of his life to excavation work. He died in 1990, but the Turkish government rewarded his dedication, by burying him within the ancient city, next to the Tetrastoon, that was the gates welcoming pilgrims on their way to pay sacrifices at the Temple. As for the village, Kenan’s determination and dedication persuaded the government and local village folk, to move the 55 homes and one mosque 2 kilometres to the east. 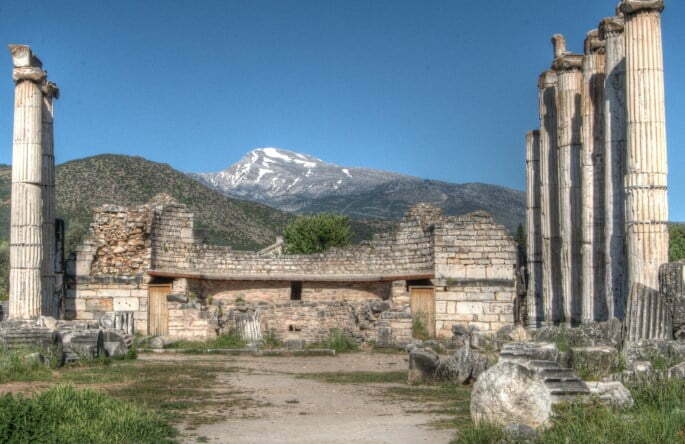 Once excavation workers demolished the houses and started working on the bare soil, they discovered many structural buildings from Aphrodisias including a theatre and marketplace. I doubted the ruins could beat my admiration for the museum but my guide had a remarkable ability to portray the history and his passion and enthusiasm for Aphrodisias, stood out as we walked through the city passing the Bouleuterion where statesmen, rulers and governors discussed city issues. 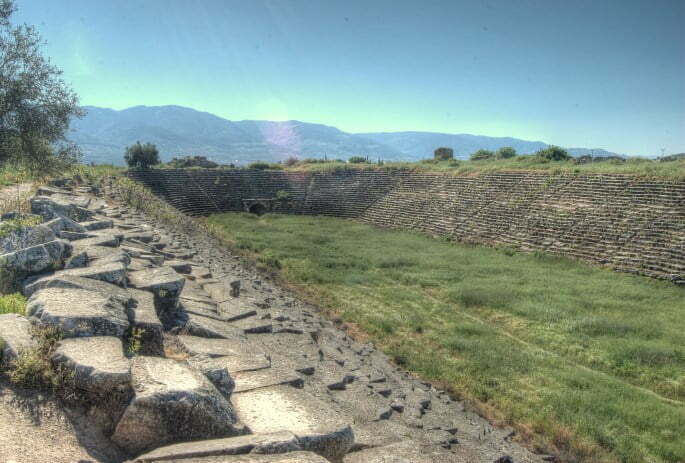 The next path took us past what was left of the baths of Hadrian to the 270-meter stadium, the active social scene of Aphrodisias. Due to society status, women sat on the back seats while rich businessmen and affluent politicians occupied the front seats with a full-frontal view of everything including the variety of animals’ sacrificed before any grand display of masculinity took place in the sports games. Next, we arrived at the temple of Aphrodite with the view of the domineering Babadag Mountain in the background. It was later converted into a church, so maybe this is why it appeared to me, a miss-mash of buildings styles, and clash of beliefs, but the best part of the ruins appeared when we started walking to the exit. All the sculptures sitting in the museum came from the ruins of the Sebasteion, of which excavation was finally completed in 1983. More importantly, Professor Kenan realised that he had found a historical gem. 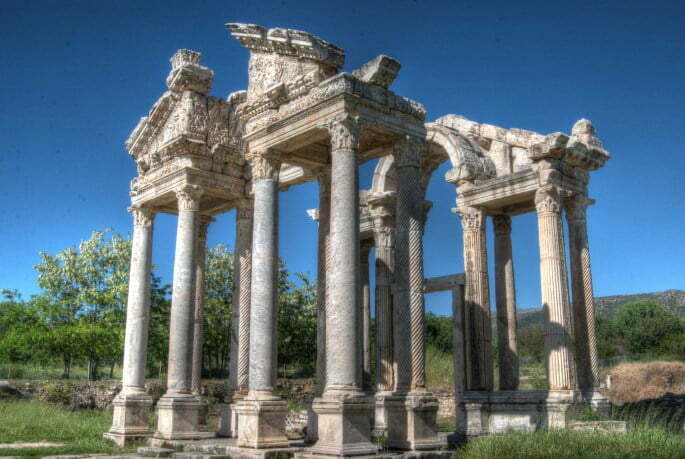 A Sebasteion is a temple complex structure and in the case of Aphrodisias, it was within a court-yard, had three storeys and typical trends of that time, were the sculptures of Roman emperors or statesmen could never be higher than the gods that were placed on the third storey. 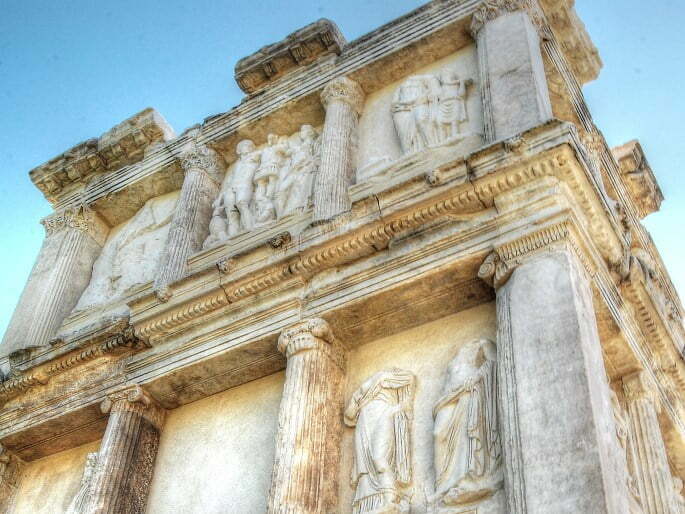 Aphrodisias broke that rule in splendid fashion by placing Roman emperors and gods on the same storey. Had they succumbed to the notion that they were just as great as the gods and this eventually lead to their downfall? 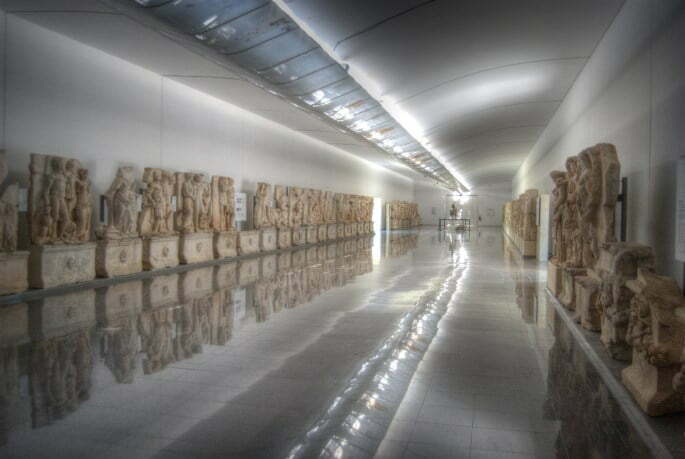 I just loved the Aphrodisias Museum and, for me, it made the argument for returning the Elgin Marbles to Athens so that they could be viewed on the same visit as the Parthenon from which they came. I loved that you could just step outside the museum and look at the ruins of the Sebasteion – or vice versa. Thank you kind sir – trying my best. Natalie — over the past 2+ years I have loved every single blog entry you have made; I have lived vicariously through what you have so creatively shared… and I lived on Turkey for two of those years! I love the country as you do, and hope one day to return in some way, shape or form. Of the places you have shared with us, I was blessed to have visited many of them– and even more. From the north east (Dogubayazit and Erzurum), to the south central (Gazientep, Antakya) to the west (Çe?me, Çanakkale and more) to the north… (Sinop, Ayder and everything in between); I love the country and it’s people. Please keep your amazing blog going — I am a faithful reader and love your every posting. . . another brilliant posting Nat – the photos are just splendid! Aphrodisias was one of my favourite historical sites in Turkey, though now I see I must have missed quite a bit of it.